An estimated 2.3 billion people – One in the three people in the world today – live without access to proper sanitation, of which approximately 900 million still defecate in the open on a daily basis. These are figures with a devastating human cost: 800 children under five years of age are estimated to die every day from diarrheal diseases caused by a lack of clean water and sanitary living conditions. The impact of the sanitation crisis is felt throughout entire nations and regions, crippling opportunities for growth and development. According to an Oxford Economics report on behalf of LIXIL, global economic losses from poor sanitation were estimated at US$223 billion (at 1 USD=100 JPY) in 2015, an increase of more than 20% from five years earlier. LIXIL has pledged to provide better sanitation to 100 million people by 2020. In addition to committing our own substantial corporate resources to this goal, we are at the forefront of public-private partnership, teaming with such organizations as UNICEF, the Japan International Cooperation Agency (JICA) and WaterAid. LIXIL is developing a number of products to fit different markets, infrastructure and income levels, as well as dealing with environmental constraints. Our primary solutions are the SATO Toilet System, already commercially available, and the Micro Flush Toilet System and Portable Toilet System, which are all currently under development. Each represents LIXIL’s dedication to improving the quality of people’s daily lives. LIXIL has also established the Social Sanitation Initiatives organization to strengthen the framework behind our commitment to resolving the global sanitation crisis through revolutionary products and sustainable businesses. Suitable for both stand-alone homes and multi-unit buildings, the system prevents clogging of the sewage system and features a comfortable sitting-type toilet that is easy to clean and maintain. A flapper valve in the toilet bowl is operated with a handle, and the valve and accumulated water prevent odors from entering the room. 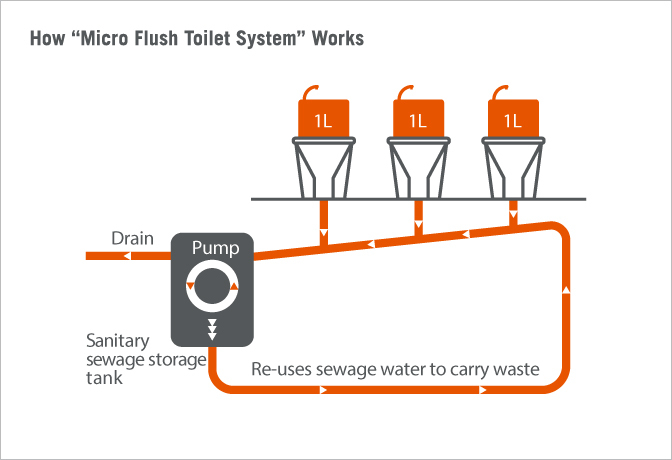 A steeply angled pipe connected to the toilet and sewage water system assists the overall flow of waste. The Portable Toilet System is an in-home sanitation solution designed for urban informal settlements that lack proper sanitation infrastructure. It is being developed and field-tested to offer disadvantaged households an ‘odorless’ toilet from which human waste can be collected and treated hygienically and efficiently. The toilet is equipped with a removable cartridge, which is transported from individual homes to a designated collection station, where the waste inside the cartridge is deposited and the cartridge cleaned. Professional waste treatment companies then collect the accumulated waste from the station and transport it to an offsite treatment site. In informal settlement areas, where many of the poorest people in developing countries live, it is difficult to build sewage collection infrastructure or pit toilets, so hygienic toilets are in short supply. 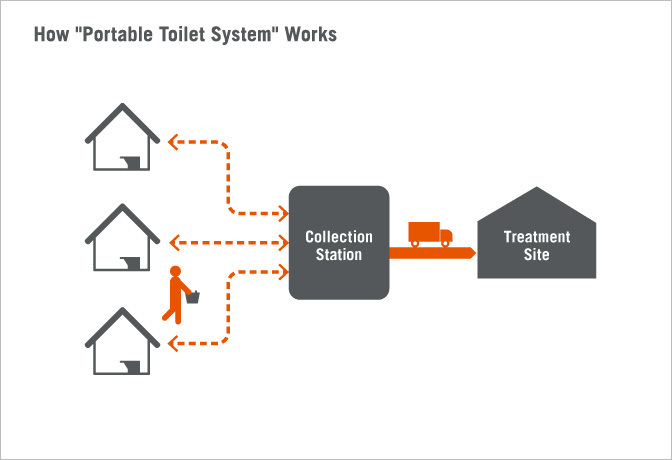 LIXIL developed a portable toilet system specifically for these areas, enabling us to introduce compact, easy-to-install toilets for individual households and a hygienic and efficient system for collecting waste. LIXIL has to date conducted a demonstration experiment in the Philippines, and in the future, aims to reflect the opinions of those who used them into product development.